When we talk about local food, it means more than just proximity to a farm. We associate supporting “local food” with supporting specific values – such as family ownership, local control, small scale, environmental stewardship, community, and ecological diversity. These values are what motivate people to buy their food directly from the farmer who grows it. The sustainable local-food system we are trying to build relies on an abundance of small, diverse, sustainable family farmers scattered all across the United States. For this kind of farm to exist, sustainable must mean more than environmental sustainability – it must also include economic viability. Farming is a dangerous and risky business, and it becomes a whole lot less attractive when a farmer knows that he or she is one fall from the hay loft away from losing their land. Access to affordable, dependable health care. In order to attract more farmers to grow food for a sustainable food system, we need meaningful health care reform that addresses the needs of farmers, rural communities, and small business owners. The stark reality of health care costs for farmers, who often must purchase insurance as individuals and pay more for it as a result, is enough to make anyone waiver in their desire to start a farm. * While 9 in 10 farm and ranch operators have health insurance, nearly one-quarter (23%) report that insurance premiums and other out-of-pocket health care costs are causing financial difficulties for themselves and their families. * Those respondents who reported financial problems were spending on average 42% of their incomes on insurance premiums and out-of-pocket health care costs. * In addition, 44% report spending at least a tenth of their annual income on health insurance premiums, prescriptions, and other out-of-pocket medical costs. Right now, Floriano pays about $1,000 a month for her family’s health insurance – excluding dental or vision coverage. Her coverage pays for only a few doctor visits a year, she says. There’s also a $10,000 deductible for medical care before insurance kicks in. With all these costs, Floriano says sometimes other bills have to wait. Insurance costs eat into the family’s limited income, she says. Works, who has been farming for 27 years, pays $9,000 a year for a catastrophic health insurance plan with a steep $5,000 deductible and 50% co-pays after the deductible has been reached. During the presidential campaign, Barack Obama promised to reform the broken health care system, and legislators in Congress are starting to work on proposals. Coalitions like Health Care for America Now! are organizing, and they need you to show your support and push our elected officials to ignore the deep pockets of corporate insurance lobbyists and build a health care system that works for everyone. Please get involved in the fight for health care reform. You can sign this Center for Rural Affairs petition calling for incoming Secretary of Health and Human Services Tom Daschle to make reforms that work for all of America; join, support, or volunteer for a group in your area doing health care reform work such as these members of Health Care for America Now; and of course, call your legislators and demand that they reform the health care system. 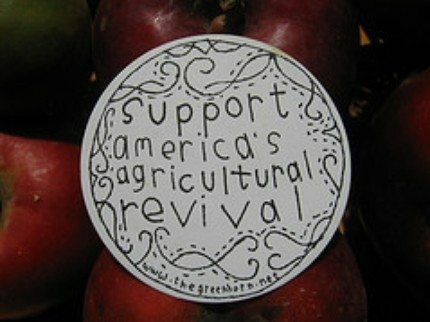 If local and sustainable food is the goal, health care reform must be included to get there. It’s not only the farmer at the market you buy your eggs from that needs you. It’s also the office assistant or factory worker who would love nothing better than to grow the food that feeds our movement. With health-insurance reform, the tallest barrier between new farmers and their land crumbles. Steph Larsen is currently the Rural Policy Organizer for the Center for Rural Affairs in northeast Nebraska, before which she spent three years in Washington, D.C. working with Community Food Security Coalition. She holds an MS in geography from her home state of Wisconsin. Photo credit: Sticker image from the Irresistible Fleet of Bicycles, the revolutionary blog of the Greenhorns documentary and the young farmer movement.